I. INTRODUCTION. The limbic system is considered the anatomic substrate that underlies behavioral and emotional expression. It is expressed through the hypothalamus by way of the autonomic nervous system. A. The orbitofrontal cortex mediates the conscious perception of smell. It has reciprocal connections with the mediodorsal nucleus of the thalamus. It is interconnected through the medial forebrain bundle with the septal area and hypothalamic nuclei. B. The mediodorsal nucleus of the thalamus has reciprocal connections with the orbitofrontal and prefrontal cortices as well as the hypothalamus. It receives input from the amygdala and plays a role in affective behavior and memory. C. The anterior nucleus of the thalamus receives input from the mamillary nucleus through the mamillothalamic tract and fornix. It projects to the cingulate gyrus and is a major link in the Papez circuit. D. The septal area is a telencephalic structure. It has reciprocal connections with the hip-pocampal formation through the fornix and with the hypothalamus through the medial forebrain bundle. It projects through the stria medullaris (thalami) to the habe-nular nucleus. 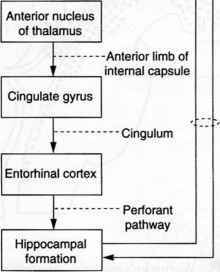 E. The limbic lobe includes the subcallosal area, paraterminal gyrus, cingulate gyrus and isthmus, and parahippocampal gyrus, which includes the uncus. It contains, buried in the parahippocampal gyrus, the hippocampal formation and amygdaloid nuclear complex. 1. The dentate gyrus, which has a three-layered archicortex. It contains granule cells that receive hippocampal input and project output to the pyramidal cells of the hippocampus and subiculum. 2. The hippocampus (cornu Ammonis), which has a three-layered archicortex. It contains pyramidal cells that project through the fornix to the septal area and hypothalamus. 3. The subiculum, which receives input through the hippocampal pyramidal cells. 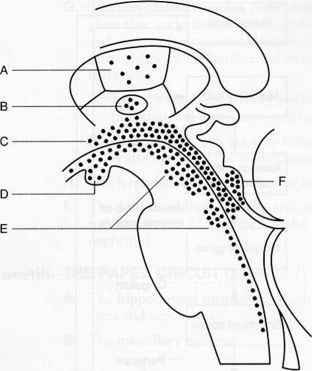 It projects through the fornix to the mamillary nuclei and the anterior nucleus of the thalamus. G. The amygdaloid complex (amygdala) [Figure 20-1 ; see also Figure 21-1] is a basal ganglion that underlies the parahippocampal uncus. In humans, stimulation causes fear and signs of sympathetic overactivity. In other animals, stimulation results in cessation of activity and heightened attentiveness. Lesions cause placidity and hypersexual behavior. 1. Input is from the sensory association cortices, olfactory bulb and cortex, hypothalamus and septal area, and hippocampal formation. 2. Output is through the stria terminalis to the hypothalamus and septal area. There is also output to the mediodorsal nucleus of the thalamus. H. The hypothalamus has reciprocal connections with the amygdala. I. The limbic midbrain nuclei and associated neurotransmitters include the ventral tegmental area (dopamine), raphe nuclei (serotonin), and locus ceruleus (norepinephrine). Figure 20-1. Major connections of the amygdaloid nucleus. This nucleus receives input from three major sources: the olfactory system, sensory association and limbic cortices, and hypothalamus. Major output is through two channels: the stria terminalis projects to the hypothalamus and the septal area, and the ventral amyg-dalofugal pathway (VAFP) projects to the hypothalamus, brain stem, and spinal cord. A smaller efferent bundle, the diagonal band of Broca, projects to the septal area. 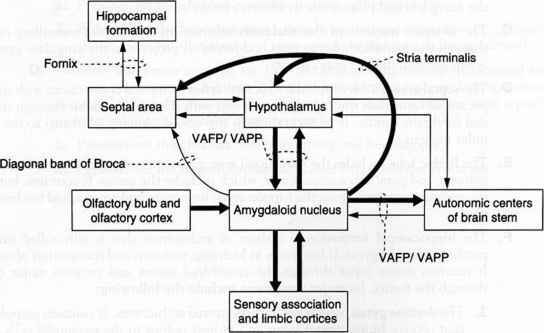 Afferent fibers from the hypothalamus and brain stem enter the amygdaloid nucleus through the ventral amygdalopetal pathway (VAPP). Figure 20-2. 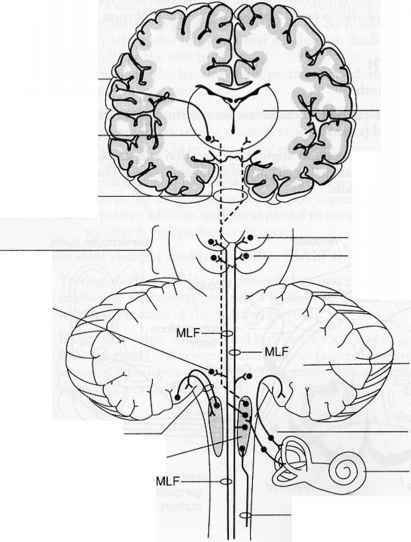 Major afferent and efferent limbic connections of the hippocampal formation. This formation has three components: the hippocampus (cornu Ammonis), subiculum, and dentate gyrus. The hippocampus projects to the septal area, the subiculum projects to the mamillary nuclei, and the dentate gyrus does not project beyond the hippocampal formation. The circuit of Papez follows this route: hippocampal formation to mamillary nucleus to anterior thalamic nucleus to cingulate gyrus to entorhinal cortex to hippocampal formation. A. Kliiver-Bucy syndrome results from bilateral ablation of the anterior temporal lobes, including the amygdaloid nuclei. It causes psychic blindness (visual agnosia), hyper-phagia, docility (placidity), and hypersexuality. B. Amnestic (confabulatory) syndrome results from bilateral infarction of the hippocampal formation (i.e., hippocampal branches of the posterior cerebral arteries and anterior choroidal arteries of the internal carotid arteries). It causes anterograde amnesia (i.e., inability to learn and retain new information). Memory loss suggests hippocampal pathology. C. Foster Kennedy syndrome results from meningioma of the olfactory groove. The meningioma compresses the olfactory tract and optic nerve. Ipsilateral anosmia and optic atrophy and contralateral papilledema occur as a result of increased intracranial pressure. D. The hippocampus is the most epileptogenic part of the cerebrum. Lesions may cause psychomotor attacks. Sommer's sector is very sensitive to ischemia. E. Bilateral transection of the fornix may cause the acute amnestic syndrome (i.e., inability to consolidate short-term memory into long-term memory). Figure 20-3. Midsagittal section through the brain stem and dienccphalon showing the distribution of lesions in Wernicke's encephalopathy. (A) Mediodorsal nucleus of the thalamus. (B) Massa intermedia. (C) Periventricular area. (D) Mamillary nuclei. (E) Midbrain and pontine tegmentum. (F) Inferior colliculus. Lesions in the mamillary nuclei arc associated with Wernicke's encephalopathy and thiamine (vitamin B() deficiency. F. Wernicke's encephalopathy results from a thiamine (vitamin Bj) deficiency. The clinical triad includes ocular disturbances and nystagmus, gait ataxia, and mental dysfunction. Pathologic features include mamillary nuclei, MD nuclei of the thalamus, and periaqueductal gray and pontine tegmentum (Figure 20-3). G. Strachan's syndrome results from high-dose thiamine (vitamin Bj) therapy. The clinical triad includes spinal ataxia, optic atrophy, and nerve deafness. H. Bilateral destruction or removal of the cingulate gyri causes loss of initiative and inhibition as well as dulling of the emotions. Memory is unaffected. Lesions of the anterior cingulate gyri cause placidity. 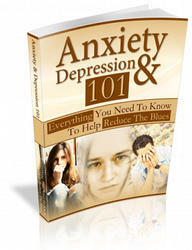 Cingulectomy is used to treat severe anxiety and depression.